As a rule I try not to say game X is like game Y in my reviews, it always seems reductive and I often have to qualify it with a hundred different statements to say how it is different. The Bug Butcher however is something that no one can deny its inspiration. The Bug Butcher is the early 90’s classic game Pang, but with bugs. Again, I acknowledge the reductive nature of that statement but just the screenshots in this review will prove my point. Now whilst I make a blunt statement like that in no way is that something that should be taken as a negative, quite the opposite, Pang was awesome, and The Bug Butcher is just as awesome but with all the modern improvements you would hope for an expect to see in a game in that style released today. Pang (Buster Bros in America) for the uneducated amongst you was a game where bouncing bubbles threatened death if they touched you, in your pith helmet you must pop each bubble, and the number of smaller bubbles that emerge, until the stage is clear. The catch is that you can only shoot vertically up. 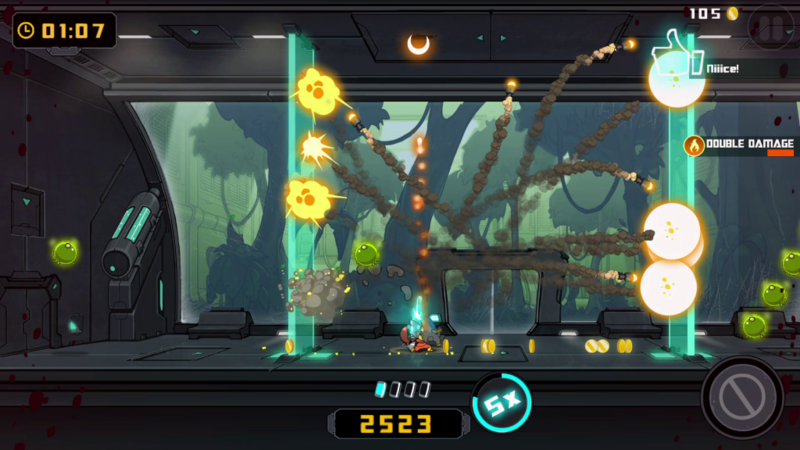 The Bug Butcher takes this concept and runs with it to produce a great arcade shooter that is perfect for the Nintendo Switch. 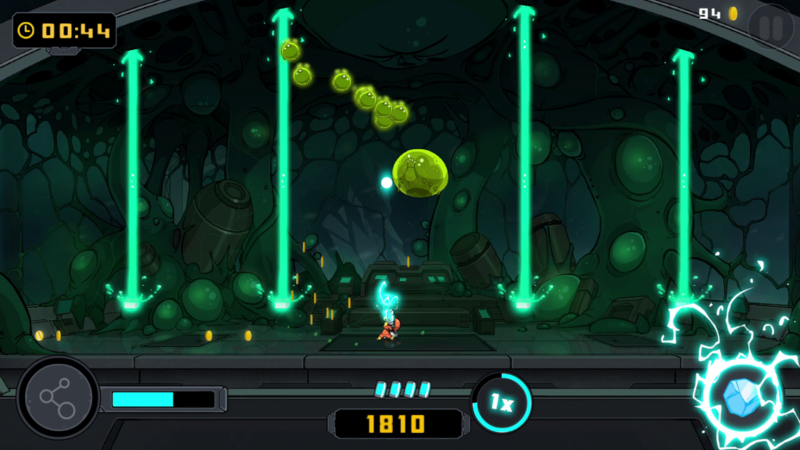 Rather than doing a world tour and popping bubbles like in Pang, The Bug Butcher is set in a research base where the titular bugs have taken over. You must clear house of these oddly cute creatures whilst protecting the one remaining scientist knocking around the facility. 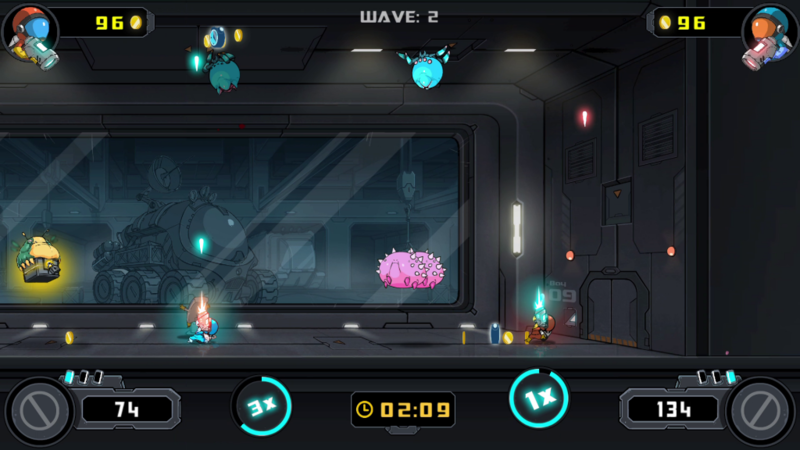 In gameplay this boils down to 5 stages each with 6 rooms, you must survive waves of enemies that fly, bounce and crawl around the screen with the intention of killing you, though with their movement patterns it often seems like damaging you is an accident so it could be said you’re the bad guy in this scenario, especially with the name of ‘The Bug Butcher’. Starting with just a simple pistol-esque weapon the enemies vary from one hit kills to needing a few shots to wipe them out, some then go on to produce smaller offspring that are harder to hit. With each murder you perform you are showered with coins that can be used to permanently upgrade your character or alternatively purchase the potential for new weapons and special attacks to pop up randomly during the chaos of the level. They range from the truly awesome laser gun to the lighting shot that I still struggle to work out the benefit of. The super moves however all universally have positive outcomes, from a bubble shield to temporarily protect your immediate area to freeze grenade that sticks everyone to place in the air. The ability to upgrade both yourself and the weapons/abilities available all adds to the replayabilty but also the feverish risk/reward nature of the game. As you dash across the screen to grab some coins to upgrade yourself you have to instantly check to see if that’s going to put you in the path of a bouncing blob of doom. I have an internal conflict with the co-op mode in The Bug Butcher, on one had it’s truly excels and is a lot of fun but in a true contradiction with that it also falls short of what I need to keep me returning. Two players taking on this chaos is a great experience and has some real danger to it, after each wave of enemies you’re given the chance to upgrade but even just hitting the shop button can cause someone to lose one of their 3 health tokens. I just wish there was a bit more to the co-op experience however, you simply choose one of the five stages from the single player, with it’s various modifiers like barriers that blink in and out of existence changing bounce patterns, and play through the waves. Having the main story being playable in co-op or giving some real purpose other than beat your record would be a nice incentive to keep returning. On death both players lose all progress meaning that, like with many roguelikes, you’re simply looking for that one perfect run. Graphically the game is striking, the animation style is reminiscent of Behemoth game’s art style in Alien Hominid but the real selling point is the constantly perfect and smooth frame rate, even with two players, a screen full of enemies and all of their accompanying projectiles, I didn’t experience a single drop in frames both in docked and handheld modes on the Switch. The sound design fits the arcadey nature of the game with all of the in your face effects you would want and an oddly anthemic soundtrack playing along during the menu sections builds a dramatic mood for the game ahead. The Bug Butcher is a perfect Switch game, it is a great pick up and play experience for players who just need to kill some time commuting or on a lunch break, and with it’s co-op mode being quick and easy to get into everything about this screams buy me on the Switch. Where the Bug Butcher falls is just the length of the game, in a few hours you can finish the story and with multiplayer having no real consequence it’s easy to play it, have an awesome time, but then leave. The game does feature a Panic Mode that is simply a last as long as you can type experience but again like co-op there is no wider reason to play other than to beat your own records. 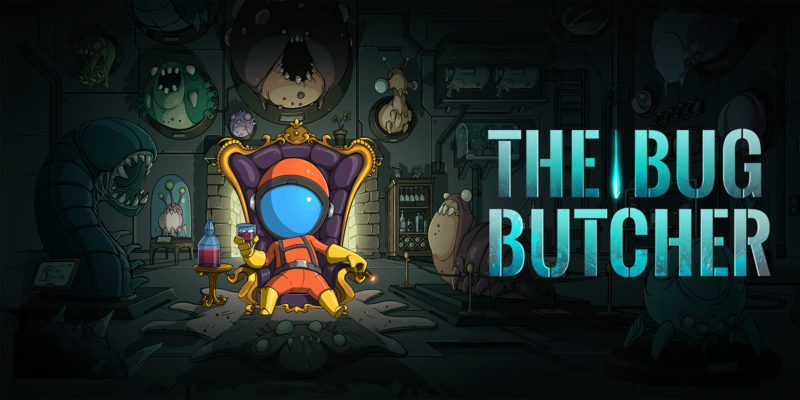 The Bug Butcher is a beautiful release with solid gameplay and honestly fun co-op, I just came out of it longing for some extra features or modes or even just a reason to play co-op or panic mode.